Excalibur 1066 is the first cigar that has ever combined the rich Honduran taste with the richness of a Cameroon wrapper. The blend is a combination of Honduran, Nicaraguan and Dominican tobaccos. The character of the cigar is further enhanced by a select Broadleaf binder grown in the Connecticut River Valley. The experience: Excalibur 1066 gives the discriminating smoker the very best of two worlds, rich flavor and Connecticut smoothness. This is my daily cigar of choice. The Cameroon wrapper adds a spicy taste that is a slight bump up to the smooth flavor and draw of the other blend of tobacco leaves. I find it to be a little less than medium bodied which, with this cigar, is just right for me. I love the Excalibur cigars from Hoyo de Monterrey. Tried this green label 1066 with a Cameroon wrapper and has quickly become one of my favorite sticks. Great flavor in a medium to full bodied cigar. 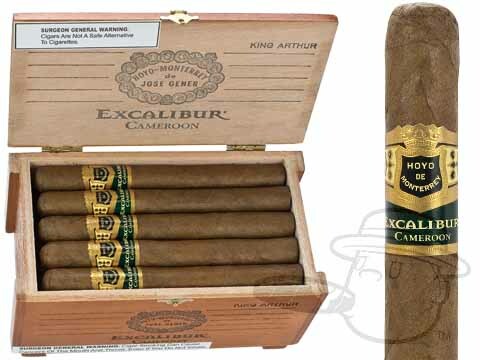 Excalibur 1066 King Arthur Cameroon is rated 4.8 out of 5 based on 2 customer ratings.